Nationalist cleric Moqtada al-Sadr and Iranian-backed militia chief Hadi al-Amiri, who won first and second place respectively in Iraq's May parliamentary election, announced on Tuesday an alliance between their political blocs. The move announced from the Shia holy city of Najaf is the first serious step towards forming a new government after weeks of negotiations between parties. It comes exactly one month after an election marred by historically low turnout and fraud allegations. The cleric, who once led violent campaigns against the US occupation that ended in 2011, has emerged as a nationalist opponent of powerful Shia parties allied with neighbouring Iran and as a champion of the poor. Amiri, a fluent Farsi speaker, is Iran's closest ally in Iraq, having spent two years in exile there during the era of Saddam Hussein. The Fatih alliance he led in the election was composed of political groups tied to Iran-backed Shia militias who helped government forces dislodge Islamic State militants from the third of Iraq they seized four years ago. 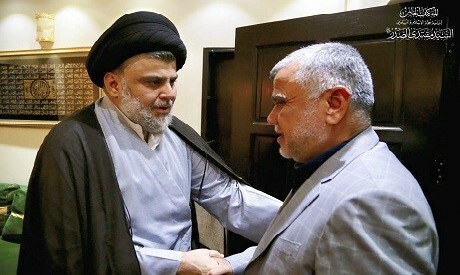 "Fatih and Saeroon announce forming the nucleus of the largest bloc and call on all winning blocs to participate in this alliance under a government programme agreed upon by all that is suitable to face the challenges, crises, and problems facing Iraq," a Fatih spokesman said in a statement. The alliance, which together has 101 seats, 64 short of the majority needed to form a government, came hours after Prime Minister Haider al-Abadi, who's own bloc came third, urged politicians to keep negotiating over government formation despite an impending nationwide manual recount of votes. "The matter is exclusively in the hands of the judiciary, not politicians. The government and parliament don't have the power to cancel the election," Abadi said of a repeat. "I welcome Sayed Moqtada's announcement that his followers commit to not having weapons outside the framework of the state. We consider this good," he said, adding that those responsible for the explosion would be brought to justice. "What happened in Sadr City is very regrettable, it is a crime. Those responsible will receive their just punishment."